Paintball exists so that people can play at shooting each other without using real guns. Somebody released a video game where you play at pretending to shoot each other from the comfort of your front room. 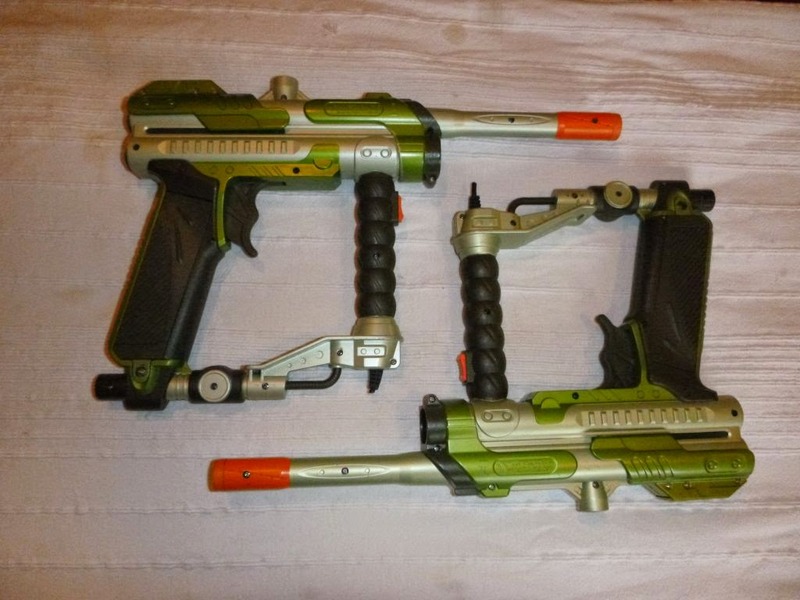 Now I've been gifted these two paintball style light guns from that game and plan to convert them to Lasertag so we can use them to run around in the woods pretending to shoot each other. With a pretend version of a pretend gun. They are really cool looking though and without the paintball reservoirs on top make an excellent base for some scifi blaster pistol style guns. As with a lot of these light guns there are a plethora of switches set up nicely and the original light sensor assembly will probably make a good base for a Lasertag emitter. Because this was some kind of standalone game they even have a battery holder in the grip, which I may re-use if there's plenty of space elsewhere in the body. Apparently the 'slide' on top shoots back when you fire, but I suspect that will be a casualty of having to fit a Lasertag circuit, sound board, speaker etc.